Recently I was browsing the Oughterard Heritage Site when I came across the name “Acton”. 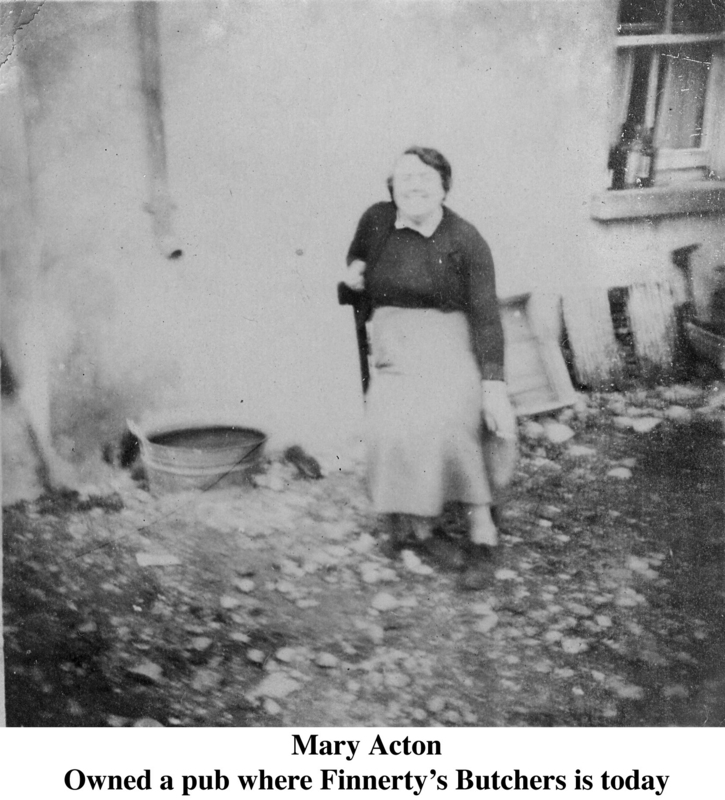 On accessing I found it to be Mary Acton who had been a publican in Oughterard many years ago. This brought back memories to when I was about ten years of age, c 1950. I had accompanied my father the four and a half miles by road to Oughterard in a horse drawn cart to get household provisions. When the shopping was done we went to Mary Acton’s pub where my father had a pint of “Porter” and I was treated by Mary to my first glass of fizzy lemonade. A real joy to a ten year old! Sadly, there was nothing to indicate who Mary Acton was or any indication of her background. In the following I hope to give some detail. Mary was born December 17 th , 1890 in Doon, Rosscahill. She was of a family of nine, born to James Acton and Catherine Kyne from Knockranny. She was baptised in Killannin church on December 21 st 1890. Her baptismal sponsors were Patrick Acton and Mary Kyne. Mary did not marry and died unexpectedly in the old family home in Doon on November 16 th 1957. Her uncle Michael Acton, son of John and Winifred (Keady), Doon joined the Royal Irish Constabulary in Dublin on August 8 th 1876 at the age of twenty. He was recommended by James E. Jackson, Justice of the Peace, Killaguile House and on April 28 th 1877 he was posted to County Carlow. In 1891 he was promoted to Assistant Sergeant and in 1900 to Sergeant. He was transferred to the Reserve (mobile position) in April 1902 and retired on pension on September 11 th 1902. He moved to Oughterard where he purchased the public house owned by Michael Houlahan, a retired RIC man, who was recorded as a widower with two children in the 1901 census. In November, 1908 he married Mary Kyne, daughter of Tim Kyne, Knockranny in Moycullen church. He died in Oughterard on July 26 th 1920. His wife Mary died December 15 th 1935. No known issue. Following the death of Mary Acton in 1957 the licence was granted to her sister Sarah Acton of Doon on July 7 th 1958 and on November 19 th 1958 it was granted to Rita Reilly. On June 8 th 1961 the licence was extinguished and a new licence was granted to Martin Faherty, Oughterard in its place. I have been unable to find any written document indicating when the name appeared in Doon, prior to 1851. The land rentals records for the Ross Estate from 1808 to 1820 does not show that name. I once asked my late mother how the surname came to be there. Her reply was that “Old Acton”, who was her maternal GG grandfather, was on his way from West Galway to the city when his jennet (Hinny) collapsed and died at the Corner House (Burke’s) in Doon. He remained in the area and married a girl named “Faherty”. His first name is unknown, but believed to be John? The census record for 1851, extracted in June 1920, show a John and Winny Axal who married in 1842, with sons: James 6 years, John 4 years and Patt 6 weeks. John, Junior, emigrated to the USA. He married in Ashland, Mass. in 1874 and gave the name of his father as “John Acton” and his mother as “Winifred” (Kady). John Acton, Doon who was married to Winifred Keady died in 1867. His death was reported by Thomas Roarke, Drimneen, Oughterard who is shown in marriage records to have been a widower when he married Mary Heraghty, daughter of Murtagh Heraghty, Derreenmeel, Oughterard in 1865. Winifred Acton died in 1887. 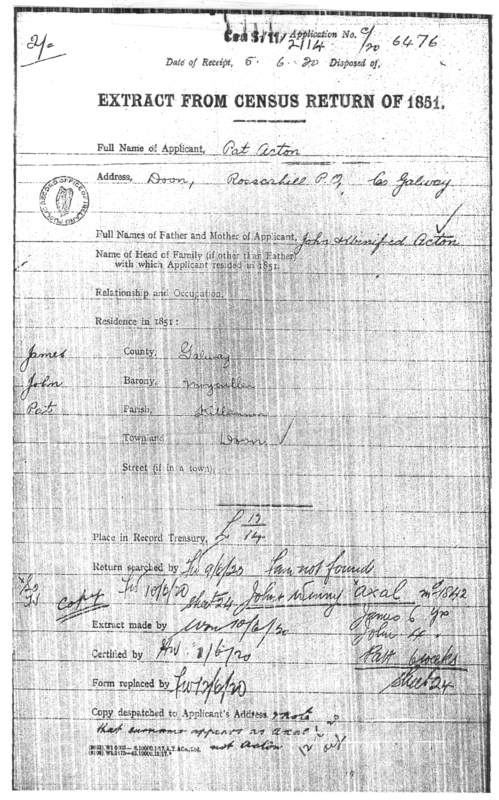 Known siblings of John (1) are: James Acton who married Mary Mullowney, daughter of Michael Mullowney, Gortacarnaun and sister to Patrick and John, c1853 and who settled in Knockaunranny, Moycullen parish. Michael Mullowney was maternal Great grandfather of my father. Catherine Acton who married Mark Faherty in the Village of Aille Bui (Yellow Cliff) and Sarah Acton who married Walter McDonagh in th Village of Doon North in 1844 (1851 census). The Acton, Faherty and McDonagh families are now extinct in Doon. Due to the lack of records in Killannin parish prior to 1875, a share of the aforementioned is open to question. Any addition or correction to this post is welcome. This page was added on 26/03/2014. The answer to your question is YES. Patrick Fahy was the younger brother of my late grandfather – James Fahy – 1855 – 1917 who is buried with his wife Bridget Moloney in Kilcummin cemetery. See Fahy/Lee for another brother. Jim Fahy – I am thinking we have to be related. My grandmother was Catherine (Kate) Fahy who was born in Gurthacornan in 1901. Her parents were Patrick Fahy (b 1868) and Mary Maloney (Mullowny). One of the witnesses at their wedding was Kate Acton. I also recall having cousins Malloy. I’m sure this all connects some how. I’m at katieclair@yahoo.com. Would love to hear from you. Thanks! Would you be willing to share your information with me and what would be the easiest way to do so? Mark Faherty and Catherine Acton were my maternal GG grandparents. I have some detail on both families. Loved the article. Does anyone have any more info on Catherine Acton and Mark Faherty. They had a son Mark Flaherty (Spelling Changed in USA) who married Sarah Geoghegan in Ashland, MA. She was the daughter of Michael Geoghegan and Bridget Craven also from Oughterard. I just loved reading about people from the past. Mary Acton gave me my first job. She also guided me on thr right road. Thanks David and a big Thanks to Jim Fahy.